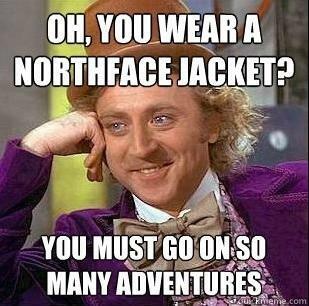 The North Face's video contest...you scared?! Discussion in 'Downhill & Freeride' started by Ridemonkey.com, May 9, 2012. Check it out! The North Face and Bike Magazine want to send you to Whistler, all expenses paid! But first they need to know that you can send it. Details inside! On the other hand, if you're scared...go to church? Geez, I've seen video clips on here that should be submitted. You guys are slackers - someone step up! would me hucking that big drop on my youtube channel be good enough? I think that can be arranged, now all I need to do is find a tricycle. I'm only voting for a unicycle video if the rider is wearing a clown costume. And the clown shoes. Especially the shoes. how about a rainbow wig i got from splat? No giant red shoes, no care. I'm sure I'll regret asking this... but why you have a clown costume? Goes with the clown nose, cigars, afro wig, and english cabby hat. yes!!!!!!!! they notified me earlier today that i won so stoked..
Yeee dude. Sooo stoked for ya. Have fun you deserve it! Badass. Congrats! Enjoy your trip!